Too often in fundraising, planned giving gets associated solely with targeting retirees or donors who are in their twilight years. In today’s environment, however, planned giving has a much broader potential audience. Download this new white paper on how to engage planned giving donors in their 30’s and 40’s. Society is now going through what is commonly referred to as “the great wealth transfer.” This is an unprecedented opportunity for your planned giving program to capture donor passion and transform your organization. Which segment of your donor and prospect database is the best target for planned giving discussions? It may surprise a lot of fundraisers and nonprofit organizations to learn that research indicates the answer to that question is Generation X. In 2014, more than $28 billion was donated to nonprofit organizations via planned gift bequests. This represented approximately eight percent of 2014’s overall fundraising total. Planned giving is an important component of fundraising programs, and organizations that focus on the right audience now will reap tremendous benefits in the coming years and decades. This new white paper can help provide insight into establishing those practices for your organization. 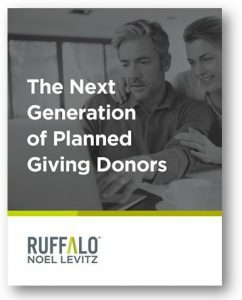 Click here to download The Next Generation of Planned Giving Donors. And if you have any questions about the paper or about planned giving strategies, please email me.